Eye On Tampa Bay: EIGHT IS ENOUGH! Promote Rulers to Sovereign, Impose Term Limits! EIGHT IS ENOUGH! Promote Rulers to Sovereign, Impose Term Limits! Term limits are restrictions. They are imposed to restrict and limit the number of years or terms someone may serve in the same office. Term limits are imposed so that one person cannot hold an office for life and so a variety of people can serve. There were 40 term limit ballot initiatives, including a few trying to remove term limits or extend the term limit, across the country on the November 2016 ballot. Term limits won in 100% of them all. Some electeds today have turned Franklin's statement upside down. They believe the people are the servants and the rulers are superiors and sovereigns. They refuse to abide by term limits. At the local level, government without term limits may become disinterested in the everyday concerns of the citizen and more interested in pursuing an agenda benefitting special interests and their donor base. The longer local electeds park themselves for years and years on the same governing board they become very "artful" at gaming the system. This can lead to a breeding ground for cronyism and corruption. Local term limits are popular with Floridians. In 2012, an amendment to the Miami-Dade County Charter was put on the ballot limiting county commissioner terms to two consecutive four year terms - EIGHT IS ENOUGH years. It was massively passed by Miami-Dade County voters 77-23%. Closer to home, an EIGHT IS ENOUGH ballot initiative, led by citizens, was placed on the Pinellas County ballot in 1996. This amendment limiting county commissioners to eight years - two four year terms - was also massively passed by Pinellas voters 72-28%. Having power can be like a addictive drug. Once one is hooked, they are addicted to power and do not want to give it up. The Pinellas County commissioners refused to give up their power addiction and refused to abide by the overwhelming wishes of the will of the people. The convoluted legal mess that ensued is eye popping. Of course lawsuits were filed and the commissioners simply continued ignoring the amendment. The timeline of the legal actions is here. The District Court of Appeals of Florida, District Two, ruled in favor of the term limit amendment in May 2000. Then the State Supreme Court in May 2002 ruled it unconstitutional, on a ground they later reversed in May 2012. The Florida Supreme Court sent the case back in 2002 to the District Court of Appeals who then reversed their previous 2000 ruling. In May 2012, the Florida Supreme Court reversed the reason they had ruled Pinellas County term limit amendment unconstitutional but did not reverse their ruling on the amendment. More lawsuits were filed but in 2013/2014 the Circuit Court used a technicality that the Florida Supreme Court had "receded" from its prior position, leaving its original ruling against the Pinellas County term limits amendment intact. That legalistic jingo'ing used for the Pinellas lawsuit ruling was obviously unfair to the voters of Pinellas County. The "receded" Supreme Court position enabled term limits amendments challenged in Broward, Sarasota and Duval counties to all be ruled constitutional. In 1992, term limits were massively passed by voters in Duval/Jacksonville 77-23%. Jacksonville/Duval County became consolidated in 1968 and Jacksonville City Council consists of 19 members, 14 single member districts and 5 at-large countywide districts. The term limits in their Charter is clear - no jumping from single member to at-large districts - EIGHT IS ENOUGH! No person elected for two consecutive full terms as a member of the council shall be eligible for election as a council member in the next succeeding term. In 2000 Broward County voters massively passed a term limit amendment 80-20% limiting county commissioners to three four year consecutive terms (12 years) that also ended up in court. The Florida Supreme Court in May 2012 even cited the Pinellas 2000 ruling in their ruling in favor of Broward's term limit amendment. 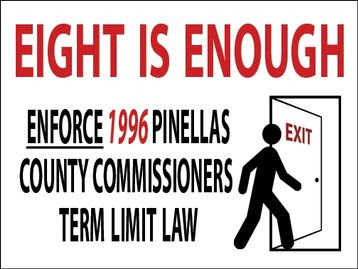 In 1998 Sarasota County overwhelmingly passed 68-32% an EIGHT IS ENOUGH term limit amendment limiting county commissioners to two four year terms. However, the term limit amendment was challenged in a county court and never implemented until 2012 when the Florida Supreme Court ruled it constitutional. In Pinellas County, Barb Haselden, running for Pinellas County Commission District 6, promises to bring the EIGHT IS ENOUGH term limit issue back to the county commission. Good for Barb and for the overwhelming massive majority of Pinellas voters who voted for term limits in 1996. Haselden's current challengers are two Republican state legislators Larry Ahern and Kathleen Peters. Ahern is being term limited this year out of his state House District 66 seat. Ahern was appointed to the Pinellas County 2015-2016 Charter Review Commission that refused to take up the term limit issue. Pinellas county citizens brought the term limit issue to the Charter Review Commission asking that a new term limit amendment be placed on the 2016 ballot. This commission refused to even take the issue up. Now Ahern's running for a county commission seat of unlimited term....Anyone think he will now champion term limits??? Side note: Whether good, bad or indifferent, since term limits were imposed on state legislators overwhelmingly by voters 77-23% in 1992, leap frogging back from the state legislature to local races across Florida has certainly resulted. But local government is where some powerful decisions about zoning, land use and development are made - ripe for corruption. Lots of county contracts are handed out and lots of taxpayer dollars doled out - too often with no questions asked. The county is where some cozy close personal relationships can rule the day and determine an outcome. In 1983 three corrupt Hillsborough county commissioners were arrested for bribery and extortion and subsequently went to prison. That corrupt mess led to the Hillsborough County Charter approved by voters in September 1983. The 1983 Charter included term limits and increased the Commission Board from five to seven members, representing four District and three Countywide districts. The intent of creating district and countywide seats was to give every county voter the opportunity to vote for four commissioners (one district and three countywide), a majority of the seven Board members. District and countywide seats were not intended for commissioners to leap back and forth between district and countywide races on the same governing board. Unfortunately, the term limit language in the Hillsborough County Charter has a gaping hole that has been exploited. This loophole enables the term limit clock to restart. It has already enabled county commissioners to leap frog from District seats to Countywide seats extending the length of time they serve on the county commission. Norman, Hagan and Higginbotham successfully did it. 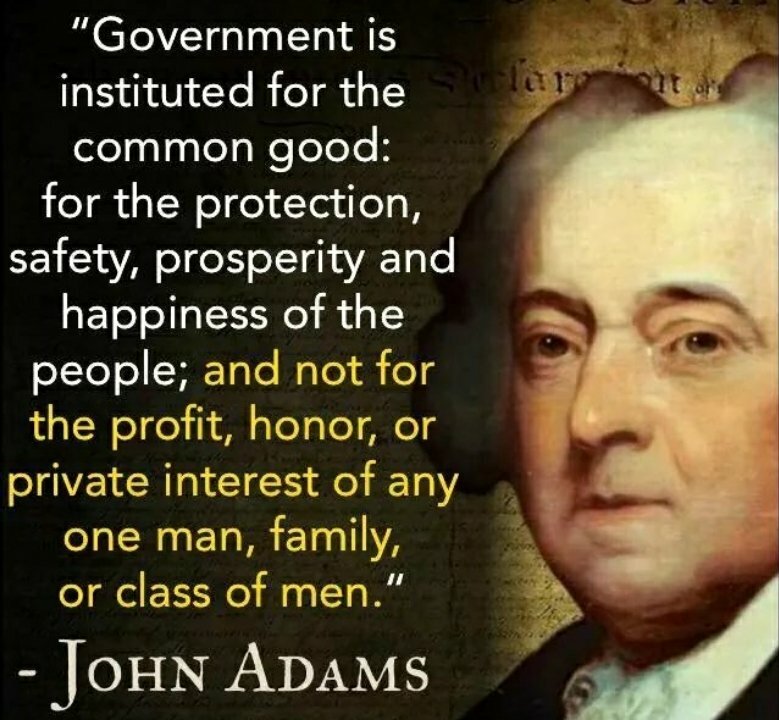 And it is happening again this election year. Commissioner Crist, term limited in District 2 this year, is jumping to the countywide seat Hagan is term limited in. Commissioner Murman is doing what Hagan did in 2010 and jumping mid-term to run countywide in a non-Presidential election year. Murman, who was just re-elected to her District 1 seat in 2016, is jumping mid-term to run for Higginbotham's countywide seat since he is not running for re-election. Crist and Murman were former state legislators. Crist spent 18 years in the state legislature from 1992-2010. When he was finally term limited from his state senate seat in 2010, he conveniently leaped directly back to his District 2 county commission seat courtesy of Hagan jumping mid-term. Murman served 8 years in the state house from 1996-2004 and did not leap frog back immediately but was first elected to her District 1 seat in 2010. Leap frogging from District to Countywide races is bad enough for violating the spirit of term limits. The chess game of leaping from District to Countywide to keep their power at County Center is now getting worse. Jumping from a District seat to Countywide and then flip flopping back to a District seat previously held is unprecedented. In the 34 years since the county charter was implemented, no commissioner has tried it. After 16 too long years, Hillsborough County Commissioner Hagan wants to continue his dynasty by egregiously ignoring term limits and running again. While Hagan's official candidacy paperwork he filed states he is leap frogging back to run for a District 2 seat he first was elected to in 2002, he's not. As we posted here, Hagan is officially Candidate Hagan, running for District Rays. And his unprecedented campaign war chest for a single District commission race of almost $460K proves it. Lots of his donors are special interests, organizations and people who do not live in District 2 and cannot vote for him. In 2014 Hagan raised a campaign war chest of over $300K to intentionally keep away challengers from his countywide race. It worked back then. But 2018 is not 2014. Candidate Rays Hagan has a Republican Primary challenger Chris Paradies. Paradies supports closing the term limit loophole, and like Haselden, supports imposing a term limit of two consecutive four year terms - EIGHT IS ENOUGH. Republican voters in Hillsborough County's District 2 commission race can impose their own term limits, by tossing out Candidate Rays Hagan who most egregiously violates county term limits. In the August Primary, District 2 Republican voters can vote for new blood, a fresh face with new ideas, vote for fresh air in County Center, and someone not tied to crony corrupt politics. And vote to elect Paradies. Those outside District 2 who support his cause can also help by hitting his donate button. Republican voters can do the same in Pinellas County Commission District 6 Primary race. In the August Primary, District 6 Republican voters can reject recycling another state legislator. They can vote for someone who will bring fiscal common sense, accountability and a breath of fresh air to the Pinellas County Commission. And vote to elect Haselden. Those outside District 6 who support her cause can also help by hitting her donate button. 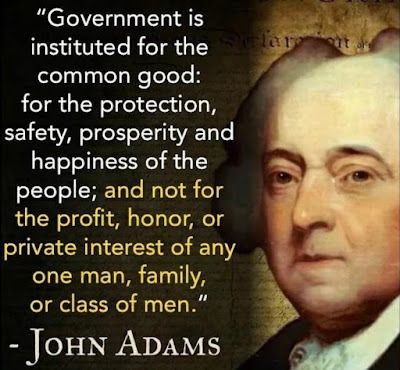 Good governance requires proper oversight and transparency - not behind the scenes colluding and back door shenanigans with crony confidantes, crony consultants, deep pocketed donors and special interests. Candidates Haselden and Paradies promise to support term limits and be champions for transparency and for taxpayers - not special interests. Haselden is a long time small business owner in Pinellas for 28 years who understands the need for good governance and the real life consequences of bad governance. In Hillsborough, Paradies is also a small business owner, who graduated from West Point, is an Army veteran with a law degree and PhD. In 2018, voters in Pinellas and Hillsborough can elect Haselden and Paradies and impose their own term limits on recycled career politico challengers. Then enough is enough. Time to champion clear, concise term limits in both Hillsborough and Pinellas County Charters to ensure the rulers are promoted back to the sovereign.